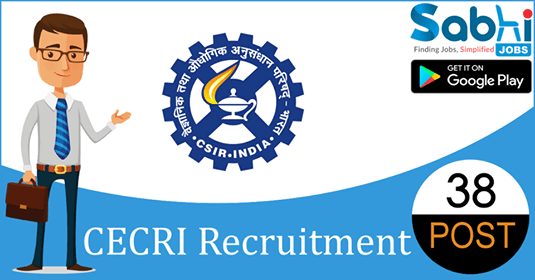 CECRI recruitment 2018-19 notification has been released on official website www.cecri.res.in for the recruitment of 38 vacancies at Central Electrochemical Research Institute. The candidate who is looking for Apprenticeship Trainee can appear for walk-in-interview on 14th August 2018. Qualification ITI in fitter/ turner/ machinist/ welder/ electrician/ wireman/ electronics mechanic/ refrigeration & A/C mechanic/ COPA/ plumber/ carpenter from a recognized institute. How to Apply Interested and eligible candidates may appear for walk-in-interview with duly filled application form along with all original & attested copies of certificates of educational qualifications etc. at the time of interview. Venue of Interview: At Central Electrochemical Research Institute, Karaikudi.